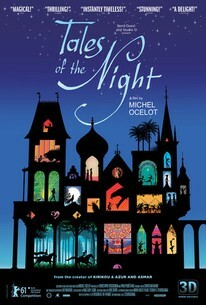 From renowned animator and storyteller Michel Ocelot (Kirikou and the Sorceress, Azur & Asmar) comes a dazzling and magical film that is certain to delight children, families and animation fans of all ages. Every night, a girl, a boy and an old technician meet in a small derelict movie theatre brimful of wonders. Silhouetted characters set off against exquisitely detailed backgrounds bursting with color and kaleidoscopic patterns, as the film weaves together six exotic fables each unfolding in a unique locale, from Tibet, to medieval Europe, an Aztec kingdom, the African plains, and even the Land of the Dead. In Ocelot’s storytelling, history blends with fairytale as viewers are whisked off to enchanted lands full of dragons, werewolves, captive princesses, sorcerers, and enormous talking bees – and each fable ends with its own ironic twist.